Whisk eggs and egg whites until frothy. Add half and half, 1/2 cup parmesan cheese, thyme, salt and pepper and stir to combine; set aside. Heat olive oil in an oven proof 10-inch skillet on the stove top. Add asparagus, scallions and red pepper and saute for 5 minutes. Stir in egg mixture and cook over medium heat until almost set lifting the edges of the frittata to allow the uncooked egg to flow underneath the cooked mixture. Transfer skillet to oven and bake 5 minutes until eggs are set on top. Remove from oven, sprinkle additional parmesan cheese and thyme sprigs over the frittata. 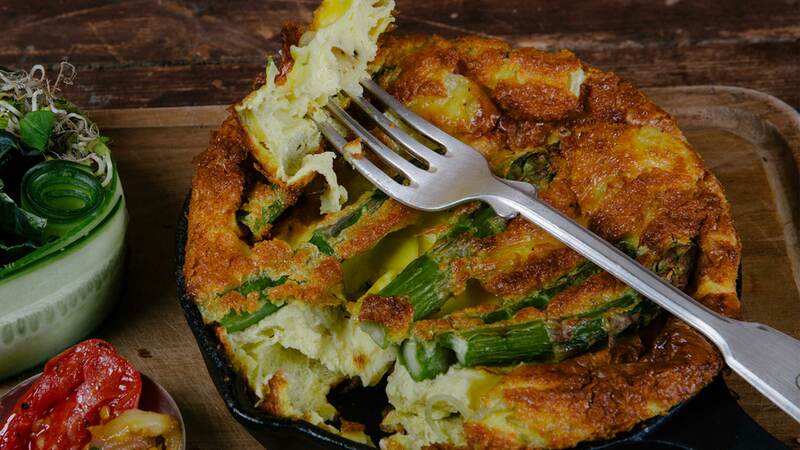 Allow frittata to set for 3 minutes, cut into wedges and serve.